This bread, I have to tell you, is a revelation – a genuine flavour of my continental childhood. The first taste was one of those ‘madelaine’ moments, where time peels away and you’re no more than five or six years old again, standing in your childhood kitchen with a slice of bread and butter in your hand. Heaven. Of course, milk bread may not have the same associations for you as it does for me. Still, I would suggest you give this bread a go, because, childhood memories or not, it’s marvellous. In a large mixing bowl, rub the butter roughly through the flour until no large lumps remain. Then add the sugar, salt and yeast to the bowl, keeping the yeast and salt on opposite sides of the bowl. Add about two thirds of the milk, and mix gently using your fingers. The recipe calls for the addition of warmed milk. To save on wastage, I warmed 250ml of milk to blood heat in the microwave, and used this for the initial addition. The rest of the milk, I added straight from the bottle. Add it a little at a time until you form a nice soft dough. My favourite way of judging this is to add the milk (or water, in a traditional bread recipe) until the dough is *just* getting a bit too wet, then add back a sprinkle of extra flour to compensate. That way, you know your dough is as well hydrated as it can be. Oil your work surface and knead the dough until it is soft, smooth, silky, and elastic. 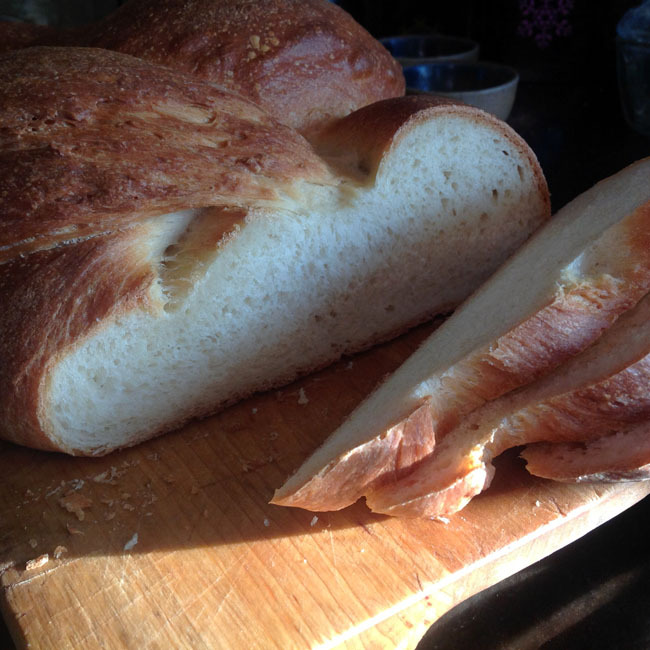 I love kneading bread, there’s something deeply therapeutic and – dare I say it? – sensual about it. Then return your dough to an oiled mixing bowl and cover loosely with cling film, and leave it to rise for a couple of hours. I find that this dough goes off like a rocket – it must be the sugar in the mix, the little yeasty beasties really set to and it rises like a balloon being inflated. Still, give it time (which develops flavour, too) and let it tripple or more in size. For me, milk bread has to be in the form of a plaited loaf. It’s just traditional. This dough is remarkable, elastic stuff, something I learned to my cost the first time I made it. If you work it too much during knocking back, before trying to form your loaf, you will end up with tight springy little balls of dough that resist stubbornly any attempt to shape them into the long sausage-shapes you need to make your plait. So, turn the risen dough out onto an oiled work surface, and divide it by eye into three even portions (they won’t end up even, but don’t worry about this too much!). Taking each one, knock it back gently and then immediately start folding the sides towards the centre to form your sausages. You may need to roll these a little, using your hands as if the dough is a rolling pin, to get the length you need. Once you have your three pieces, join them together at one end, make a plait, and turn both ends under to make it tidy. Place your plaited loaf on a lined baking sheet, cover loosely again (I prefer oiled cling film), and set it aside to rise. Allow it to at least double, just be careful it doesn’t rise so fast it tries to escape from your baking sheet! Once it’s well risen, pre-heat your oven to 210 C. Brush the loaf gently all over with a little extra milk, and then slide it straight into the oven and bake it for 25 minutes until the crust is quite a dark brown colour and the loaf sounds hollow when tapped underneath. Cool on a wire rack (or on a cold oven shelf, which used to serve me perfectly well for cooling loaves and cakes before I bought a ‘proper’ one). What can I say about this loaf that isn’t unbearably mawkish? Well, it’s pretty perfect. That dark, shiny crust conceals a wonderful soft even white crumb. It’s not sweet, despite the sugar addition, but has a rich smoothness from the milk. It’s wonderful on its own, with butter and jam, but also makes a quite marvellous soft bacon sandwich. I commend this loaf heartily to you. Hardcover, 304 pages, full colour. RRP £20. I reviewed ‘Paul Hollywood’s Bread’ earlier in this series, and this book is it’s immediate predecessor, on the same imprint. As you’d expect, then, pretty much everything I said then also applies here – with lavish illustration throughout and good ‘step by step’ photography of the basic processes. The scope of this book is a little wider than ‘Bread’, with chapters on basic and flavoured breads, an extensive section on sourdough baking, as well as good coverage of enriched doughs (croissants, pastries and brioche), and a decent selection of cakes, biscuits, puddings, pies and tarts, too. This additional breadth may or may not be a benefit, depending on your specific interests! This book lacks the accompanying ‘serving-suggestion’ recipe for each of the loaves that was a feature of ‘Bread’. Overall I would definitely consider adding this book to your library if you’re at all interested in expanding your home baking repertoire. I can see myself experimenting with a lot more of these recipes in the future, and this milk loaf has jumped straight onto the ‘house standards’ list. 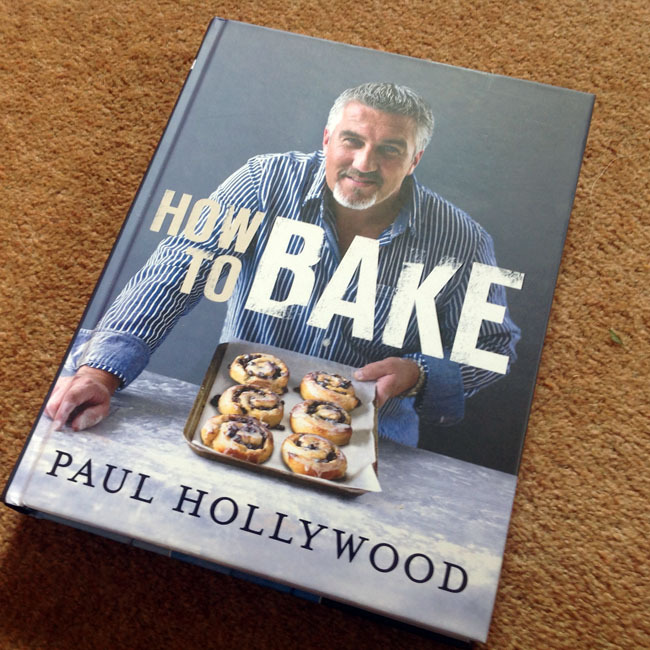 This entry was posted in Baking, Books, Bread, Challenge, Cooking the Books, Recipe, Review, Seasons and tagged bread, country skills, food, milk bread, Paul Hollywood, recipe, seasonal by Kate Watson. Bookmark the permalink. Looking forward to reading your blog: my boyfriend and I did a similar cookbook challenge last year! We had 114 books at the time (and have more now…) and vowed to use them all within a year. It was a bit fraught at the end but we managed it! Now we’re onto a new challenge, cooking foods from around the world. Good luck with yours!